Of course the only reason to eat chocolate is for the health benefits. The same is true for red wine, coffee and a drink of alcohol or two a day. As this week dark chocolate is thought to be good for you, thanks to the "trained panelists" at Consumer Reports who stepped up to the plate and tested the best dark chocolate bars on the market. 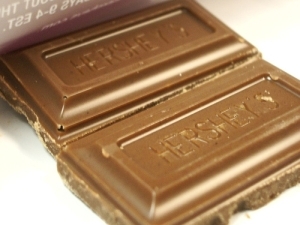 Their #1 pick is a bit surprising: Cacao Reserve by Hershey's ExtraDark. The worst of the bars they tested is Newman's Own Organics Sweet Dark, which you eat at your own peril. True chocolate lovers may want to skip ahead to a real chocolate review website, seventypercent.com, which has reviews of some of the bars mentioned by Consumer Reports, as well as dozens of other fancy-schmancy versions. North Carolina is home to America’s first cultivated grape. Florentine navigator Giovanni de Verrazzano found it growing in our Cape Fear River Valley in 1524. They began making wine from it in the 1700s. A scuppernong is a large type of muscadine, a type of grape native to the present-day southeastern United States. It usually has a greenish or bronze color, and is similar in appearance and texture to a white grape, but rounder and about 50% larger. Its name comes from its original place of production, Scuppernong, North Carolina, where it was first grown during the 17th century, a name itself tracing back to the Algonquian word ascopo for the sweet bay tree. Several small green seeds are found in each grape. The skin is very thick and tart. The pulp is viscous and sweet. The seeds, which are bitter, can be swallowed with the pulp or extracted and spit out. The most desired part of the scuppernong is the extra sweet juice that lies underneath its skin. There is a proper and time-honored method for eating a scuppernong, the object of which is to combine its various components into a single burst of flavor. Hold the grape gently yet firmly within your thumb, index and middle fingers, with the stem scar oriented towards you. Pucker your lips around the stem scar and squeeze the grape gently while sucking the pulp and juice into your mouth, straining out the seeds through a narrow slit between your top and bottom teeth. Use a finger to flatten the grape skin against your front teeth to extract the subcutaneous flavor concentrate, while guiding the seeds away from the opening to the bottom of the grape skin. The seeds should be left inside the empty skin, to be neatly discarded. The whole process takes about a second and quickly becomes second nature. 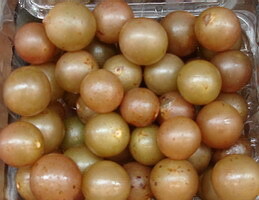 Scuppernongs figure prominently in the story "The Goophered Grapevine" (1887) by Charles W. Chesnutt, and are also mentioned in the book "To Kill a Mockingbird" by Harper Lee. The scuppernong also figures prominently in William Faulkner's novel "Absalom, Absalom!" as the plant under which Coronel Thomas Sutpen and Washington Jones sit down to drink. A friend has been quoted in a local newspaper about her attitude toward the US practice of tipping. Like it or not low wage earners are dependent on tips to make ends meet, and businesses that traditionally allow or encourage tipping are relieved of the burden of paying a living wage. At the same time, consumers presumably enjoy lower prices even if they end up paying more at the back end in tips. My friend expressed her concern that while wait staff may increase income by getting tips, agriculture workers suffer from low wages, few if any benefits, zero job security and terrible work conditions. It was only in the recent past migrant farm laborers on the North Coast were given access to drinking water while working in the fields. And, it took a court case to force the legislature to amend farm labor laws to get that. Porta-potties followed. Part of the problem of the economics of American agriculture is farm subsidies, a complex labyrinth of corporate welfare benefits paid to farmers. The subsidies are so politically prescious, so sacrosanct on the North Coast that even questioning the huge dollars paid to farm corporations can get a candidate for public office defeated or lead to a feed store knock down. Still, while apple farmers are paid handsomely when an ice storm or heavy winds ruin the crop ($29 million '95-'03 on the North Coast) not a penny of that money goes to the migrant workers whose income was also lost. The worker who picked and packed the North Coast apples likely made around $7,500-the average annual salary for migrant farmworkers in this country. In New York and in the majority of US states, the worker who picks and packs our food does not have basic labor rights. Farmworkers do not enjoy the right to overtime pay, a day of rest, unemployment or disability insurance or health insurance. More importantly, collective bargaining laws do not cover farmworkers in New York, they cannot organize to improve their lot. It took an act of the state legislature to get them drinking water and portable johns in the fields. A farmer can expect to be paid if his crop is lost, or he can be paid not to plant a crop at all. But the farm laborer whose children need to eat through the winter is likely to be ridiculed in the press and drummed out of town for fear he might stick around and attempt to collect public assistance or food stamps. On the North Coast the INS always conducts their farm commnity raids in October, after the harvest. When it comes to food (like gasoline) Americans are spoiled. The percentage of income Americans spend on food has dropped by 50 percent since the early 1900s. Statistics for the year 2000 show that Americans are spending 10.6 percent of their disposable income on all food consumed both at home and away from home. This figure has dropped dramatically over the years, from a high of 25.3 percent in 1933, 20.5 percent in 1950, and 15.1 percent in 1965. Consumers in the United States spend less of their income on food than in other countries. International statistics show huge disparities. The U.S. percentage stands at 6.4 percent, while the next lowest figures come from consumers in the United Kingdom (10.2%), Canada (10.4%), the Netherlands (10.5%), and New Zealand (10.9%). Consumers in neighboring Mexico spend nearly a quarter (24.0%) of their income on food at home, while those in India (48.4%) and the Philippines (52.9%) spend nearly half. An international research team has proposed new techniques that may lead to the mass production of meat reared not on the farm, but in the laboratory. Developments in tissue engineering mean that cells taken from animals could be grown directly into meat in a laboratory, the researchers say. Scientists believe the technology already exists to directly grow processed meat like a chicken nugget. Here's an update on a previous post on the topic of artificial meat. I don't know why exactly, but I fail to find this any more appealing, or appetizing than before. With a third suspected case of mad cow disease in Canada beef-eaters, at least of the squeamish kind, might be reluctant to pile into that next big steak or juicy hamburger. But what if the meat was certifiably safe, produced without animal cruelty, free of disease-causing organisms, fat and cholesterol controlled, packed under sanitary conditions and delivered the highest nutritional bang for a food-budget buck? What if the meat was synthetic? Imagine: a pulsing florescent lab with endless lines of stainless tray-like tables filled with blobs of quivering flesh bobbing in a slather of nutrient soup. Meat. No, the vision is not from Woody Allen's Sleeper or some other contrived science fiction scenario. This vision is from now, in what some food scientists think may well be a viable and necessary food production technology of the future. Will consumers accept artificial flesh with the same gusto they've taken farm-raised salmon, catfish and shrimp to table? Aquaculture is only one small step removed from harvesting wild catch. 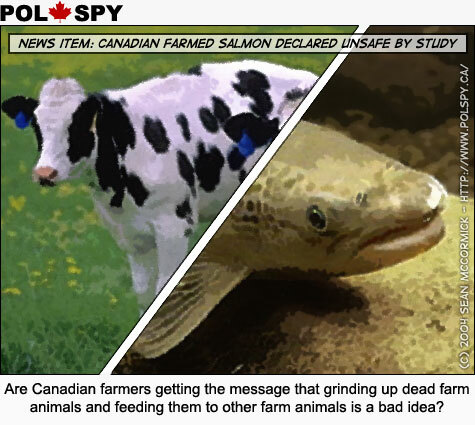 Fish farms raise whole animals-- animals with a face as the vegans would say. Few diners object. Just a few generations ago it was customary to wring the neck and pluck the feathers of Sunday dinner a few hours beforehand. These days such butchery so close at hand is hard to imagine. Kentucky Fried or Perdue chickens have no face. As creepy as it sounds, artificial flesh, synthetic meat, may be the way for future generations to eat meat that is healthier and causes no animal cruelty. Indeed, the BBQ of 2025 may be of no consequence to an animal at all. Although I've never met her I feel like Wendy and I are friends. I read her blog every day and look forward to learning what's happening in her life. Her post about MFK Fisher's writing, especially 'The Art of Eating" --a wonderful book-- was a delight. We share many interests which is why, I suppose, I find such affinity with her blog. I tried the recipe for radiator roasted tangerines and was a bit surprised to find how good they are. Not really having a radiator I was forced to improvise. I used those imported Moroccan clementines sold in boxes this time of year, peeled, picked and plopped the segments on newspaper and put them in my toaster oven with the door left open. I turned the segments once midway in the 90-minutes they spent in the moderate oven. Then, lacking a snowy windowsill nearby I put them in the freezer for about 10 minutes. Just as Wendy says, the little juicy morsels pop in your mouth, the thinnest skin all crispy and nice, the pulp maybe a bit sweeter, the flavor a bit more intense. What fun. Thanks Wendy. And, thanks MFK Fisher. 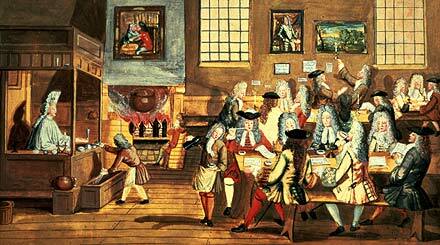 The coffee-houses that sprang up across Europe, starting around 1650, functioned as information exchanges for writers, politicians, businessmen and scientists. Like today's websites, weblogs and discussion boards, coffee-houses were lively and often unreliable sources of information that typically specialised in a particular topic or political viewpoint. They were outlets for a stream of newsletters, pamphlets, advertising free-sheets and broadsides. Depending on the interests of their customers, some coffee-houses displayed commodity prices, share prices and shipping lists, whereas others provided foreign newsletters filled with coffee-house gossip from abroad. Sort of like the North Coast Cafe doncha know.